Many people who visit the museum enjoy their visit as part of an organised group. They quickly realise that The Yorkshire Air Museum is not only for the traditional aviation enthusiast. Very often, people who have little interest in the technicalities of aviation enjoy their group visit every bit as much. If you are considering… …..
Our Mirage IVA 45/BR (Bravo Romeo) flew for the first time on May 6th, 1966, with crew Elie Buge (pilot 1923-1967, first non-commissioned officer to cross the sound barrier) and Jean Cuny. Delivered to the French Air Force on June 3rd, 1966, Bravo Romeo completed 6,309 hours of flying and 2,975 landings. It left active… …..
Join us for a day of fun, discovery and excitement at the Yorkshire Air Museum and let our Museum Guides enthral your pupils by bringing to life over 150 years of aviation history within authentic wartime surroundings! This is what schools say about their visits to the Yorkshire Air Museum: ‘Thank you so much for… …..
School Holidays can be a challenging time for parents. Keeping everyone occupied throughout any school holiday can be frustrating and finding a single attraction that everyone will enjoy can be difficult. Many families are surprised to find that everyone enjoys a visit to the Museum. School Holiday times are always the busiest period at the… ….. The Museum blog is updated regularly, as well as guest articles by some of the interesting people we meet. Not just our latest news, here you will find articles about our exhibits, the history of the air museum and some of the amazing people who served in conflicts in aviation history. Stewards Wanted at the Museum Right now we are looking to expand our team of volunteer Stewards here at the Museum. Many people who would probably enjoy this active and important role may think that you need an intimate knowledge of aircraft. In fact, anyone who is reasonably active and enjoys interacting with people can… …..
Our Shop offers a selection of carefully chosen gifts for aviation enthusiasts. From amazing publications such as the Ferry Pilots Notes, to aircraft sponsorship options which allow you to support the museum’s aircraft and enjoy personal tours of your chosen aircraft, there will be something in our store for everyone. Our payment interface is PayPal.… ….. 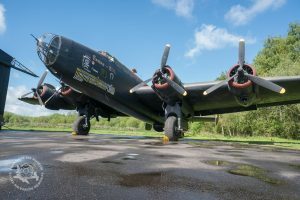 The Yorkshire Air Museum recognises and commemorates the achievements and sacrifice of allied airmen and women in all conflicts, and being on the largest original wartime RAF Bomber Command Station open to the public anywhere in the world, it has a natural tendency to focus on WWll, although all conflicts are within our scope. Retaining… …..
Sir George Cayley (1773-1857) was first to design an aerofoil and one of his flying machines made the world’s first manned heavier-than-air flight at Brompton Dale, near Scarborough, in 1849. This was more than 54 years before the Wright brothers made the first powered flight from Kitty Hawk Sands in the USA on 17 December… …..